Heeeey! Get ready - this is gonna be a good one. I was really worried that nothing could come close to last year's Inspired by a Song post with The Thong Song nails (clearly I was ahead of the times with the booty nails last year) so I kept the booty theme going and went for... Anaconda! I'm sure you're all familiar with Anaconda and the performance at the VMAs! 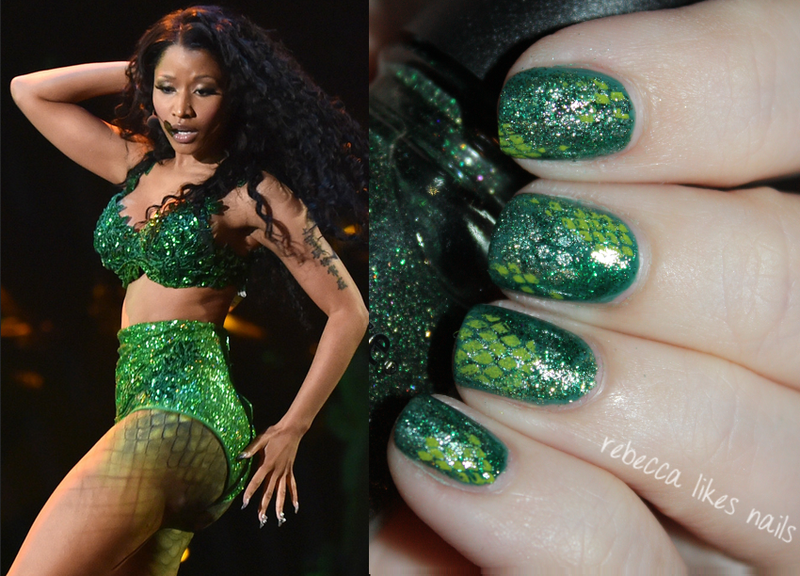 I was totally loving the green sparkly snakeskin outfit and I had to recreate it on my nails. I actually did these on like the 3rd of September because I was going to use them for the green theme, but then I just had to save them for today. I have been holding them in since then. It's been hard. They started with a base of China Glaze - Exotic Encounters. I randomly applied green glitter all over the place with China Glaze - This Is Tree-mendous (lol) and China Glaze - Emerald Sparkled. The snakeskin stamp is from Bundle Monster plate BM-215 and I first stamped it using Color Club - Perfect Mol-Ten but it wasn't as visible as I wanted, so I added some more in scattered areas with Sally Hansen Insta-Dri - Lickety-Split Lime and that totally made the effect I wanted. Guhhhhhh I just love how they turned out! I was so mad when I had to take them off after just a few hours. What do you guys think? Did I capture the look? Green sparkly nails are always my fave, I'll be doing these again as a full mani and wearing them for like a week. For sure. As soon as the challenge is over. Awesome inspiration! It looks just like the dress. Great inspiration and great nails!! Love the way they turned out! this is a great interpretation!